Basic Gundog Program: This program is a 4 to 6 month program that teaches the five simple obedience commands (sit, stay, here, heal, and down) on and off of the leash. This program also includes collar condition, force fetch, introduction to whistle commands. The program is finished off with marking and retrieving singles in land and water. The cost for this program is $650 per month. Intermediate Gundog Program: This program is a 4 to 8 month program that works on all the basics plus force work, basic handling skills (Simple left and right casts and back) and double marks in land and water. The cost for this program is $650 per month. Advanced Gundog Program: This is a 4 to 8 month program that works on all the basics, force work and teaches advanced handling. This will cover Left/Right, Back Left/Right and Angles. 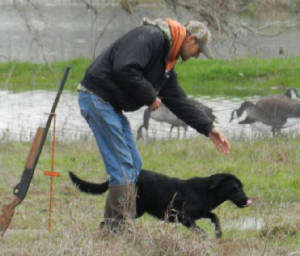 The dog will be doing multiple marks and blind retrievals. The cost for this program is $650 per month. Pre-Season Tuneups: This program is available for dogs that haven't been working much during the off season. During their stay, we will tighten up the marking, retrieving, and obedience. We will also work on getting your dog in shape so we can help prevent serious injury. The cost for this program is $650 per month. Length of stay to be determined by owner. Competition Hunting Dogs: We run AKC Hunt Tests year round. We run dog in the junior, senior, and master. Handling fees are $50 per event. Junior is no pass no pay. When the test season stops in Texas we travel north to Minnesota for the summer. We leave In June and return around September.